Campbell High School opened in 1965 and has maintained a tradition of excellence in all areas of student achievement. 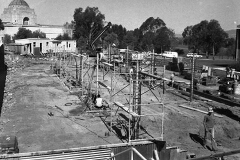 During these years, the school has had a continuous focus on academic achievement and development. The school sits at the base of Mount Ainslie and is straddled by the Australian War Memorial and CSIRO buildings and enjoys panoramic views of the parliamentary triangle. The school maintains strong links with the Clan Campbell of Scotland. Both the suburb and the school take their name from the Scottish pioneer, Robert Campbell who settled in the area in the early 1820s. The Campbell heritage colours of blue, green, white and yellow are reflected in the uniform and individual house colours. The four houses are named after prominent Australians with significant education links - Daley, Dickson, Lind and Stephens. 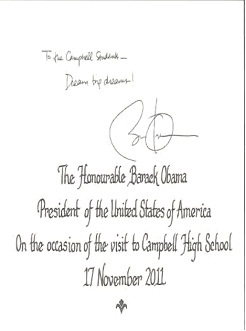 November 2011, Campbell High School had the great honour of welcoming President Barack Obama. 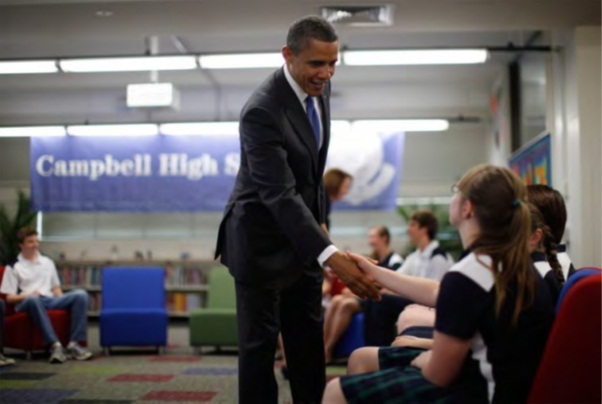 The visit was top secret and was not on his official itinerary, however he wanted to drop in to a school and talk to young people, if he had time. Whilst we made preparations and cooperated with the world's top security team, including White House officials, Secret Service, Prime Minister's Department and Chief Minister's Department, we were never really sure he would actually get to Campbell High. It seemed unimaginable! President Obama wrote a message to students in our visitor's book. " To Campbell students - Dream Big Dreams!" We intend to help our students to dream big and look forward to all the opportunities the future holds for them.